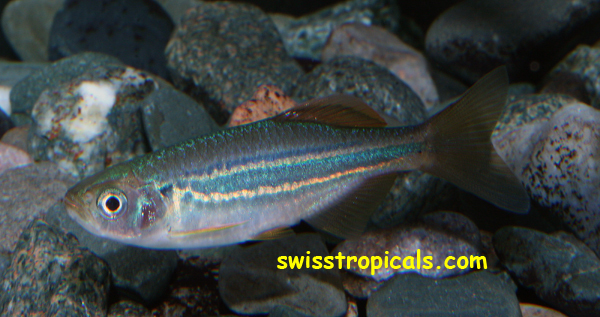 Devario acrostomus – A Fall Auction Treasure! Our clubs fall auction was this past Saturday, October 5 2013. It was a great time and the club president reports it was our biggest auction ever. I always have a great time and the variety of fish, inverts, plants and hardware that comes up for auction never ceases to amaze. All that being said, as a keeper of Danios, there is generally not much available in that area to get me fired up. Normally most of the Danios for auction are either my fish, or fish that I am already keeping. Well that certainly wasn’t the case at this auction! We must have been about 2 hours into the auction when the next item up is a small group of Giant Danios, (Devario aequipinnatus). I have a group of these already, but as I knew the seller and he always has great fish, I purchased the group. I had no more than put my new fish away in the cooler when the caller announces yet another Devario. This time it’s Devario acrostomus! Well after I got over my initial shock, I was wondering, “Where on earth could these fish have come from?” There is a very nice Aquarium Adventure store in Columbus, and they sometimes have fish you don’t see in your normal LFS, but these were Devario acrostomus! My opening bid won the auction as no one else bid, they had probably never heard of these fish before. Lucky me! Devario acrostomus is found in the country of Laos. To be a bit more specific, in the Nam Leuk river drainage both upstream and downstream of Tad Leuk waterfall, Phou Khao Khouay National Park, Vientiane Province, northwestern Laos. These fish have only been in the aquarium hobby for a couple of years, since early 2011. Up until the auction, I wasn’t aware that they had been imported into the US. So, after the auction, I get a chance to ask the seller where he had purchased these fish. When he tells me, Stephan Tanner of SwissTropicals, all I can do is smile. I will be forever in debt to Stephan for the number of rare and hard to find Danionins that he has made available. That he once had these fish was however news to me. Needless to say, my next stop was with Stephan to get some background info on the fish. Stephan said he got the fish from a friend of his at The Wet Spot Tropical Fish in Portland Oregon. As I have only had the fish a couple days and don’t have any photos, I’ll show you the photo Stephan took of one of these fish before passing them on. My next inquiry went out to Pete Cottle in the UK, (Danios and Devarios). Pete has been a very great friend to me and is the man to ask when you have a question about Danionins. In reply to my email, Pete said that he had never seen a Devario acrostomus in the flesh, which I must say, just made my day. I feel a bit guilty in saying that, but after years of reading about all the very rare and cool Danios that they get in Europe and the UK, well, it just made my day! As is always the case, Pete was a wealth of information. It seems the fish were originally caught in the wild by Kamphol Udomritthiruj of AquariCORP. 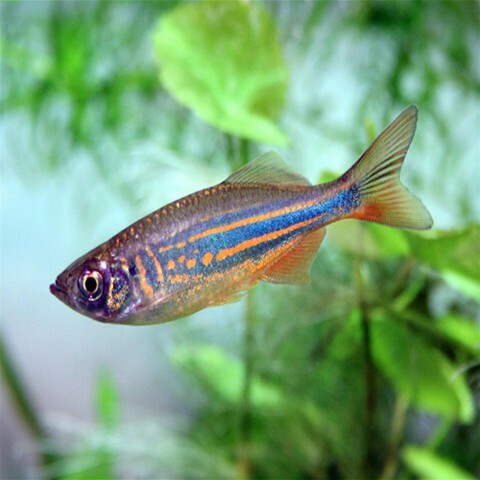 Kamphol, by the way , is the man who first found the Celestial Pearl Danio back in 2006. Next the fish went to this fellow named Patrick who runs a company called Aquaculture Technologies in Singapore. From there they went to the Wet Spot in Portland and eventually found their way to my tank. What a great day at the fall auction. Lots of fun with friends old and new, and with a bit of luck, you just never know what you might find….. Previous Previous post: Life is good!